US, 1989, 85 minutes, Colour. Karen Allen, Armand Assante, Holly Hunter, Josh Mostel, Richard Libertini, Nan Martin. Directed by H. Anne Riley. Animal Behaviour is a slight romantic comedy, working on the premise that monkeys and humans have a lot in common, especially language, understanding, automatic behaviour. Armand Assante, in a change from his usual heavies, is a music professor and would-be composer transferring to a university in New Mexico. Karen Allen is a research assistant, working with a monkey and trying to train it to understand and to behave on command. Holly Hunter, early in her career, has a typical role as a New Mexico single mother. 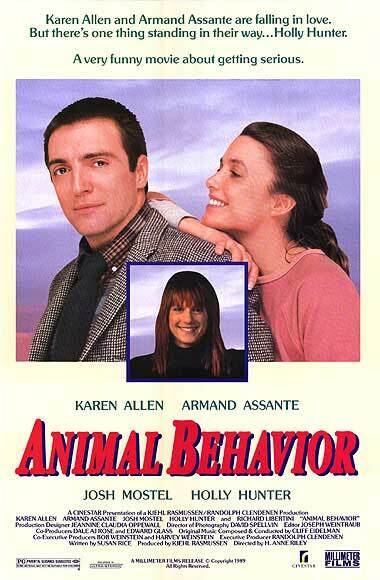 The film shows the attraction between the two professors, their animal attraction, the propensity for the woman to be jealous, the man to misunderstand. The film has some farcical moments, especially with the monkey. However, it is a happy ending kind of romance. 1. Romantic comedies and their popularity? For men? For women? 2. A film of the 80s? A nice romantic comedy? The New Mexico university setting? The terrain of New Mexico? The music professor? The scientist? The meeting between arts and science? Animal behaviour – and animal attraction? 3. The focus on Mark, his background, coming to New Mexico, the class and the dissonance in the orchestra, Cleo and her ignorance, her chasing Mark, sidling up to him at the bar, her wanting private tuition, her major in music? His encounter with Alex, his behaviour with the monkey, reassurance? His discussions with Mel and Mel’s ambition for his art project? 4. Mark settling down, his work at the university, his tuition, wanting to compose? Coral as his neighbour, her daughter and not communicating? Alex arriving and misunderstanding the situation, acting jealously? 5. Alex, her studies, her relationship with Dr Parrish, the past, his affection for her, his demands on her in terms of budget, her work with Michael, whether he could understand or not, his behaviour, responding to words, to signs? The many sequences with the monkey? Cleo going with the monkey, her being able to communicate? Signing? 6. Alex and her concern, her jealousies of Mark, yet the attraction? Her petulance? The examination, the reaction of the panel, Michael’s behaviour? Michael with Cleo, their admiration? Dr Parrish, his arrogance, everything going wrong, mayhem in the laboratory? The members of the board, their response to Dr Parrish, to Alex, to Michael? 7. Coral, her daughter, managing, cheerful, friendly with Mark, with Alex? 8. The reconciliation, the romance, the possibility of music and science being together? A future?